This marks four weeks of diving and observation without the benefit of our video system, and it looks like we won’t be getting it back from repair through next week either. It especially hurts this week because of all the interesting behaviours and vital documentation we missed. A still camera, no matter how good, simply cannot replace the flexibility of a video system. On our morning dive of July 24th, we saw another tagged turtle. We were immediately puzzled. 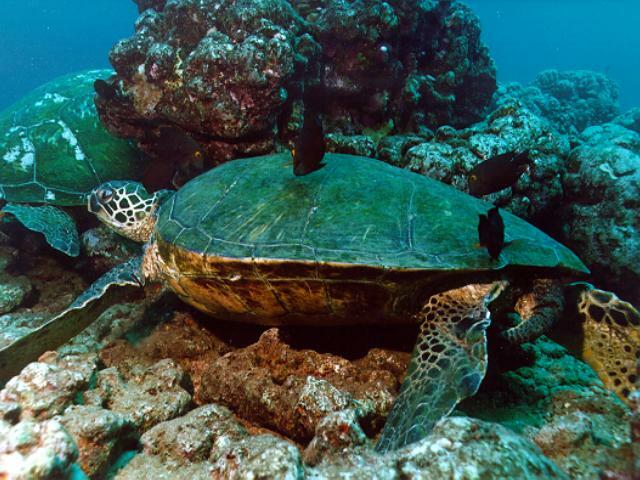 The turtle was far too small to be a mature female from the French Frigate Shoals, where turtles usually acquire their "jewellry." Additionally, the turtle was quite tame and allowed us considerable time to read the tags. Her right rear flipper sported the number 20 but the letter was unreadable, being coated with a brown algae. We tried scraping the tag, but still couldn't read the letter. Eventually, the turtle lifted, moved to another place and settled down again. This allowed another attempt to read the tags. This time we tried the one on the left front flipper. The tag read K 18, puzzling us even more. K18. May also have k19 and k20. 7/29/93, hand caught by us near Black Rock, feeding on Pterocladia, no tumors caliper length 42.5. A little guy then for sure. Seen(but not by us) 10/19/95 in the same Black Rock area. We informed George that the turtle now has eye tumors and mild growths on neck and shoulder. To date we have resighted three turtles from the Kaanapali area, which is just to the south of us and normally downcurrent Two have developed tumors in between sightings. Being constantly surrounded by disease erodes your sensibilities somewhat. 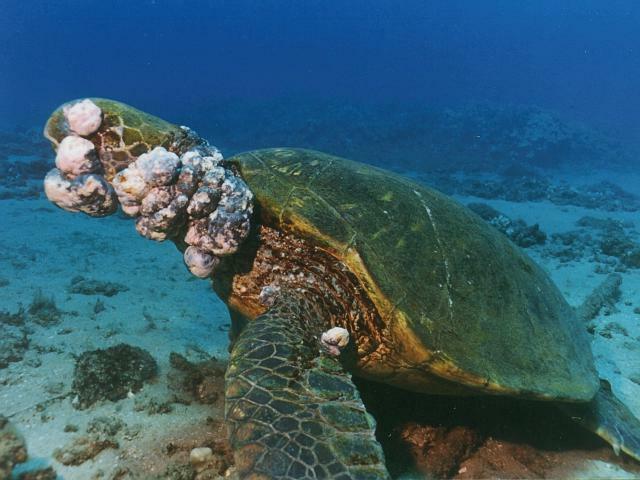 You become acclimated to the spectre of illness and debilitation, and begin to view tumored turtles as the normal state of affairs... so much so that a clean healthy turtle is merely assumed to be one asymptomatic to the disease, that is, sick with the virus, just not showing the tumors yet. The turtle’s profile was so obscured with fibropapillomas that identification was impossible. Still, once in a while we get rocked by the sights we witness. Also on the July 24th morning dive, we photographed yet another horrible tumor case. The turtle’s profile was so obscured with fibropapillomas that identification was impossible, so we don't know if we've met this animal before. This turtle, a male, had no mouth visible, leaving us to wonder how it manages to eat and breathe. Consistent with observations from previous summers, the disease is quickest to ravage the youngest turtles--tumors mushrooming to alarming size within a year. 1997 Turtle #18, a youngster burdened with active growths that interfere with swimming, is one such turtle. A mouth tumor so profound prevents this youngster from closing her mouth and gives her a rather gruesome profile. Sadly, she seems to spend all her time under her ledge, head tucked into a small hole. This week we met yet another small turtle with an advanced case of fibropapillomas. Lots of tumors, and already showing the shrunken plastron so typical of the later stages of this disease. We don’t expect this turtle to be around in 1998. She visits the Turtle House, presumably for cleaning, but because her angry white tumors attract excited attention from the butterflies, wrasses, and tobies, her visit is an obviously painful one and too soon she is forced to leave.